Prices begin at $40 per dozen and increase based on design, details, amount of colors, flavor, and packaging. Thank you for your interest in placing an order. Please read our form carefully. The more information you provide, the better we can assure your 100% satisfaction. That is our goal! You can send pictures/invitations as inspiration once you receive an email from us; however, if it's not our set, we try not to copy someone else's work exactly. That's just not nice. Each product we create is made with the finest ingredients and very special attention. It takes hours to create just one dozen cookies. We research designs, draft your order from inspiration from our research and what you provide, bake your order fresh, mix up fresh icing in your specific colors, decorate your cookies (which takes hours), and then package. It's a long, long labor of love. We strive to make sure that each new order becomes our new favorite. Our products are made with special attention and care in our home-based kitchen operating under the Cottage Food Law. Allergen Warning: WE ARE NOT A NUT FREE KITCHEN. All our products may contain or have come in contact with milk, eggs, tree nuts, peanuts, wheat and soybean. For your own safety, please do not order if you have any of the above allergies. Thank you. We look forward to making each and every set. 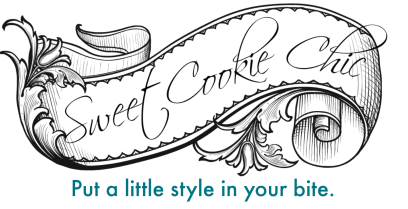 Sweet Cookie Chic is a home based bakery that operates under the Virginia Cottage Law. Our cookies are not for resale and have been processed and prepared without state inspection.